All around the world, weather conditions often mean that it’s uncomfortably hot even when you’re inside. Whether you live somewhere with scorching summers or somewhere with a more humid and tropical climate, being uncomfortable in your sanctuary is a no-no. In today’s portable air conditioner reviews, we’ll serve up a detailed buying guide to help you every step of the way. Forewarned is forearmed and the more you know about these nifty little devices, the better placed you’ll be to get the very best portable air conditioner for your needs. Being uncomfortably hot is a recipe for disaster when you’re woodworking. Sweat in the eyes and dripping down your face can lead to obscured vision and either a spoiled workpiece or an outright accident. Straight off the bat, it’s worth pointing out that portable ACs are certainly not the most effective method of regulating the temperature indoors. We’re not here to mislead you so we’re not going to lie and say these units are the optimum approach to an iced room. When set against window air conditioners or in-wall ACs, portable versions don’t fare so well. They generally cost more, they tend to sap more electricity and they are not as efficient as their permanently hooked-up counterparts. That said, we’re assuming if you’re reading this that you are looking for the upside of these portable ACs and the first of these is no expense of professional installation. Plug them in and you’re good to go. Beyond that, in basements and garages – both common locations for home workshops – a regular wall or window AC is often no a practical option. Many windows simply won’t accommodate these bigger units so a portable AC is by far better than no AC at all. Also, if you live somewhere suffering from only occasional heatwaves, it doesn’t make economical sense to go with a full-bore air conditioner. Again, portable units step in and ensure that you’re never left wiping the perspiration from your brow when you could be happily toiling away with your router or band saw. These freestanding little units are highly portable and extremely convenient. 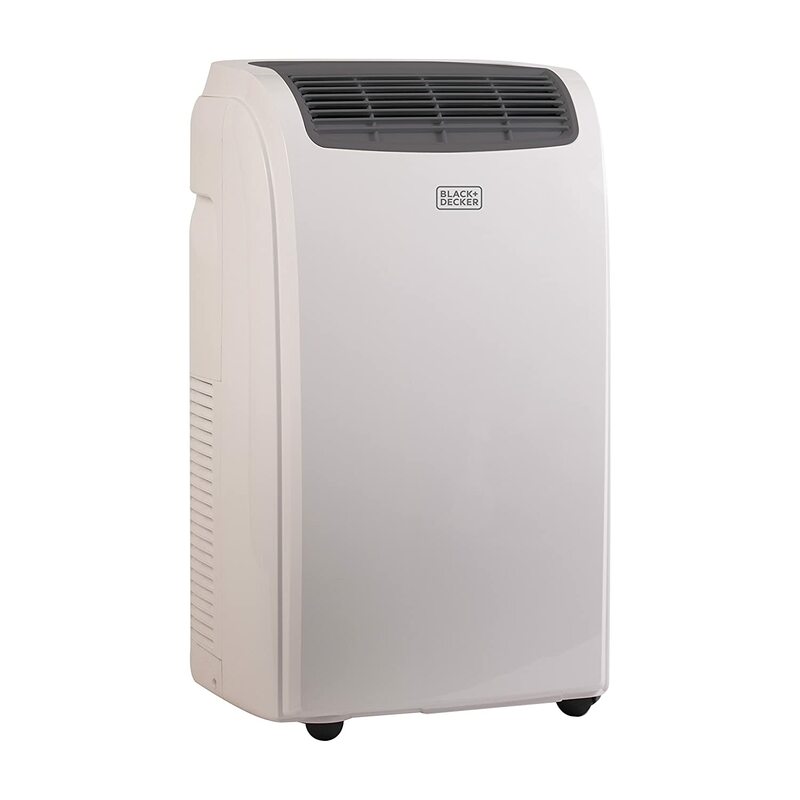 Portable ACs draw in fresh air while simultaneously getting rid of heat and moisture. In order to function properly, they need to expel warm air so there is normally a window-kit included. In the absence of windows, you can vent through a hole in the wall or a drop ceiling. Installation is a breeze and you can be up and running in minutes without needing to call in a contractor. This type of air conditioner is installed through a wall using a sleeve. Through-the-wall units usually don’t have venting mechanisms around the housing since the grills would end up blocked and efficiency would plummet. These ACs tend to be pretty weighty with outstanding cooling ability. Possibly the most common air conditioner, window ACs are installed into a regular window or, less frequently, into a pre-made hole in the wall. They are set up with the hot air exhaust facing out and the cool air intake giving you a refreshing room pretty efficiently. Functionality varies considerably but, overall, the best window air conditioner can cool or heat even larger spaces fuss-free. For a quiet and effective way to cool multiple spaces with no ducting required, a ductless mini split system air conditioner makes perfect sense. You’ll get a bulky condenser unit that goes outside while the blower units can be mounted on the walls indoors. You can control these blower units independently, they’re extremely energy-efficient and they also sit in low profile on the walls if you’re concerned about bulky ACs ruining the streamlined look of your home. PTACs are commercial-grade air conditioners beyond the scope of most homeowners. Although they are most prevalent in hotels, they can be used for sunrooms and other residential spaces so don’t write these off completely if you have the budget and conditions dictate a PTAC would be the smartest cooling solution. You generally install a PTAC through an external wall under a window. With a vast array of portable air conditioners up for grabs, even coming up with a shortlist can be challenging. Luckily, we stepped in to take the sting out of that for you. First up in our look at the best portable air conditioners on the market is a consistent best-seller from Whynter, the ARC-14S. While this portable AC certainly couldn’t be considered a budget option, it’s not eye-wateringly expensive either. With air conditioners above many other products, you need to think beyond just the price tag and calculate overall value for money based on efficiency and economy. Weighing in at 80 pounds and measuring 35 x 19 x 16 inches, “portable” might not be the first word that springs to mind when you see this large slab of an air conditioner. You’ll get a highly versatile AC if you have the space to accommodate this beast, though. It’s deceptively slimline considering its overall dimensions and you can move it around if you need to without breaking your back thanks to the handy wheels underneath. 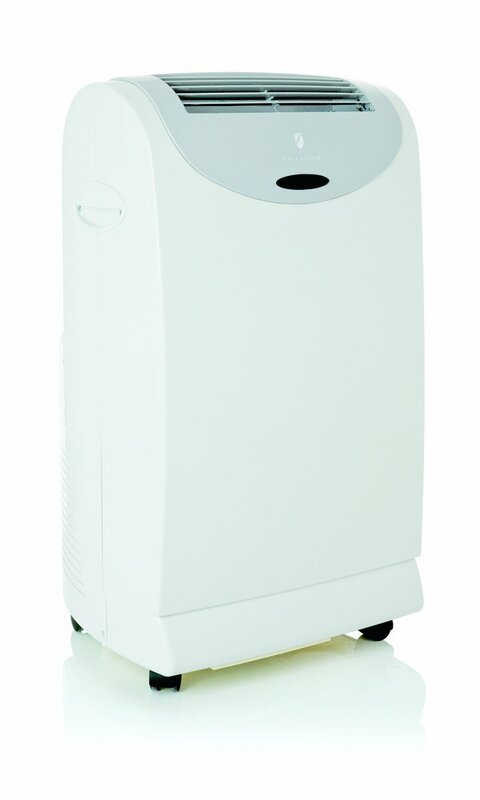 With 3-in-1 functionality, the ARC-14S serves as a regular air conditioner, fan and dehumidifier. An air filter with activated carbon will nicely purify the ambient air in whatever space you place it. This is a valuable touch whether in a workshop or inside your house. The dehumidifying capacity of the ARC-14S is an impressive 101 pints per day. Rated at 14,000n BTU, you’ll be able to cool areas up to 500 square feet so it’s more than enough for most reasonable needs. The Energy Efficiency Ratio is 11.2 meaning the Whynter is about as good as portable air conditioners get in terms of economy. Although the manufacturer comments on the quietness of operation, we have to disagree. 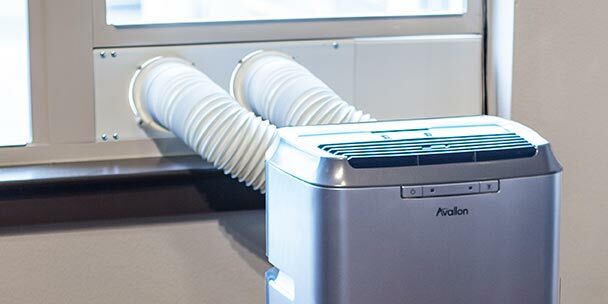 Like any portable air conditioner, especially the more capable 14,000 BTU-rated models, there’s no lack of noise so decide where you’ll be using the AC and whether or not this is an issue for you. The noise level is rated at 52 decibels. The ARC-14S makes use of a double hose for superior results. The one thing to watch out for is that replacements are annoyingly expensive. There’s a completely programmable timer so you can make sure the AC comes on and off whenever you come and go. Kiss goodbye to entering a scorching room and needing to wait for things to cool down. Whynter had the environment in mind when they designed this portable air conditioner. The refrigerant has no harmful CFCs and there are no lead components used either so this AC is eco-friendly both when in use and when it’s time to dispose of it. The cord measures up at 5 feet so make sure this gives you adequate room for maneuver. You’ll get a 1-year limited warranty which is nothing to write home about but better than a kick in the teeth. Outstanding brand heritage at a fairly affordable price point. Copes with larger spaces up to 500 square feet and rated at 14,000 BTU so a hard-hitting portable AC unit. Works as an AC, fan and dehumidifier so plenty of bang for your buck. Tweak temperature from 61 to 89 degrees Fahrenheit for complete flexibility. Crisp digital readout with a timer programmable through 24 hours. Available in 2 slick colorways to co-ordinate with your décor. Remote control for total convenience. Washable pre-filter combined with carbon air filter so ideal for anyone with allergies or sensitivities. Refrigerant is CFC-free so an eco-friendly AC that won’t punch a hole in the ozone. Lead-free components for maximum safety. No heater, cooling functionality only. By no means the cheapest portable air conditioner. Kicks out a fair amount of noise. Buying replacement hoses is expensive. There’s a good reason that Whynter top out most lists of the best portable air conditioners. If you’re looking for the most cut-throat price for an AC unit then look elsewhere. If, on the other hand, you’re in the market for a solid, high-performing portable AC that’s built to last, it’s essential to pop the ARC-14S on your shortlist. We’ve outlined a handful of drawbacks with the ARC-14S but none of them should be thought of as direct reasons not to buy. We always point out anything negative we unearth about any product so you can make a reasoned decision rather than being given a bum steer. Overall, if you want a portable air conditioner that delivers in fine style and will keep going for years, check out the Whynter ARC-14S today. It will absolutely not disappoint. Next up in our best portable air conditioner reviews is another pricier model from an industry giant, the Honeywell MN12CS. With a blacked out design and appearing more like a paper shredder than an AC unit, the Honeywell will look the part while it brings down the temperature in even larger rooms. While it tips the scales at just over 68 pounds, the compact design means it won’t eat up too much space and the casters underneath make sure the MN12CS lives up to its name as a portable air conditioner. The Honeywell measures up at 29 x 16.5 x 15.7 inches so, while it might not be tiny, it takes up less space than the Whynter if you need an air conditioner for a smaller space. In terms of cooling ability, the MN12CS is rated at 12,000 BTU meaning it can deal with rooms up to 450 square feet so it’s certainly no lightweight. If you live somewhere with high levels of humidity, the Honeywell is cut out to wick away any excess moisture in the air. It can get rid of close to 80 pints of moisture a day so it will work well even in more tropical climates. It serves as a fan, too, as well as its intended purpose of air conditioning. The combination of an ergonomic remote control and a crisp LCD display mean you can adjust the Honeywell without needing to scurry over to the unit constantly. This is particularly useful in a workshop where you might feel hotter when you’re beavering away with your miter saw then cool down slightly as you take a break. There are also feather touch controls if you prefer. 3 cooling speeds allow you to make further tweaks so you can create the perfect environment around you and focus fully on your woodworking. There’s an automatic shut-off timer so you can be sure your power bill won’t go through the roof if you go out and forget about the AC. This AC can go as low as 62 degrees Fahrenheit and you can ramp things up to 90 Fahrenheit at the upper end so there’s a wide range at your disposal. You can adjust the air in 3 directions for total flexibility. Make no mistake, the Honeywell is a hard-hitting air conditioner. Air flow is a highly respectable 163 CFM. This is a single hose model so the one length serves for both intake and exhaust. There’s a washable air filter included so you won’t be faced with the niggling ongoing costs of buying replacements. You’ll get a window venting kit included and this is super-simple to install. Another nice touch with the Honeywell is the bucketless design. Thanks to the auto-evaporative functionality, emptying buckets and draining water are a thing of the past. In common with most portable air conditioners, the noise can be bothersome. Pretty much all manufacturers claim that their AC is quiet but, at 55 decibels, it’s loud enough to get annoying at times. A manufacturer you can trust so buy with real confidence. 3 cooling speeds for maximum adaptability. Remote control allows you to fine-tune from a distance. Digital readout is clear and user-friendly. 12,000 BTU so good for larger workshops or areas up to 450 square feet. 3-in-1 functionality offers up air conditioning, dehumidification and a fan-only mode. No permanent installation required and wheels allow for easy movement between rooms. Auto-evaporation system means there’s no need to drain water or empty buckets. Air flow is extremely powerful at 163 cubic feet per minute so great for the hottest workshops. Window venting kit thrown in and remarkably easy to install. Expensive for a portable air conditioner. Relatively noisy despite the manufacturer’s claim to the contrary​​​​​. 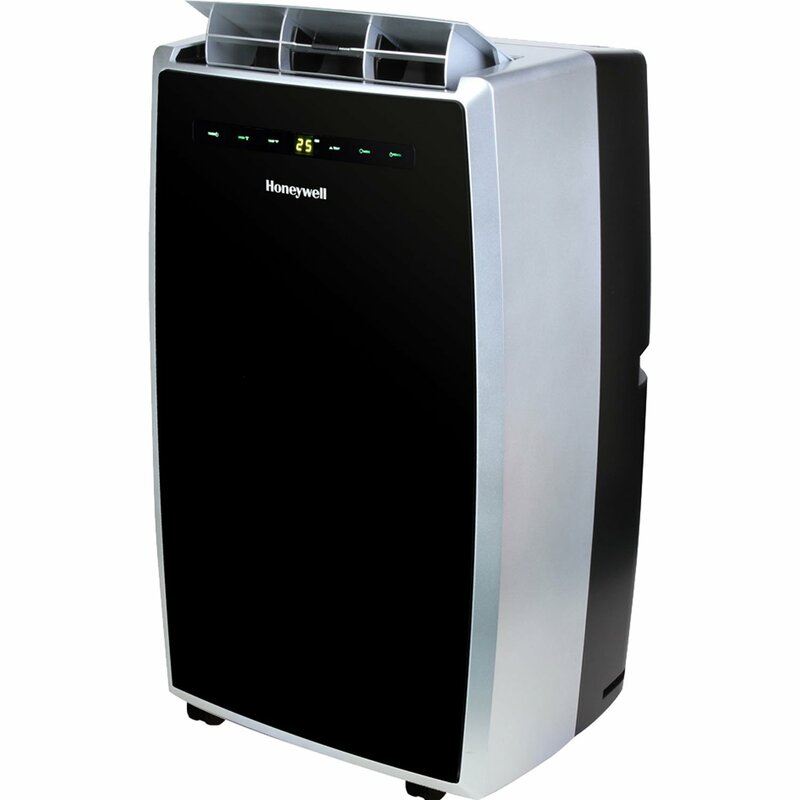 Like the Whynter, the Honeywell is not a bargain-basement portable air conditioner, but if it’s a basement you’re looking to cool down, it comes fully into its own in large spaces up to 450 square feet. Many ACs are not exactly aesthetically pleasing but the Honeywell, finished in black with flashes of silver, is easy on the eye and it’s rugged as well as attractive. The only real flashpoint is the noise it generates. Have a long think about where you’ll be using this AC. If you planned to pop it in the bedroom and still enjoy a restful night’s sleep, you might want to rethink that. Working as a straight AC, fan or a dehumidifier, you get a lot of value with the Honeywell and buying one should be considered an investment rather than a needless cost. If you place your comfort uppermost and want a portable air conditioner that won’t let you down, think seriously about the Honeywell MN12CS. With an industry-standard 1-year warranty to fall back on, there’s no reason not to give it a go! We’ve tried to include something for everyone in today’s best portable air conditioner reviews so we’ll take a look now at a much smaller option from the highly reputable BLACK + DECKER. This company sell more than just power tools and this portable AC continues their tradition of offering top-tier appliances at pocket-friendly prices. The BPACT08WT is available in 6 variants from the baseline 8000 BTU model up through to a pair of 14,000 BTU behemoths, one with heat and one without. We opted for the lower-end 8000 BTU version since we’ve already covered ACs good for larger areas. This air conditioner will cool down spaces up to about 150 square feet so think if this will be adequate for your needs before buying. If not, take a look at their other more powerful offerings. Like many of the best portable air conditioners, the BLACK + DECKER also affords you dehumidification and a fan function. The technology means that there’s no need to empty out buckets so you can relax with your woodworking projects and let the AC do its job unattended. Rated at 8,000 BTU, be realistic with your expectations if you opt for this model. It will cater for rooms at most 150 square feet in area. Don’t buy this AC expecting more of it than it can comfortably deliver. You’ve got 5 other choices from the range so refer to our buying guide, take your time and make sure you get the right one. On the plus side, this unit really is portable where some of the larger alternatives stretch that definition somewhat. It’s got a very small footprint so works well in confined spaces or scaled-down workshops. If you need to move the AC around, a combination of the wheels and handles make that a cakewalk. Cleaning filters is an integral part of the minimal maintenance required with an AC unit. You won’t need as much as a screwdriver and you can just pop the filter out, run it under the faucet, dry it off and you’re good to go. There’s little worse than being confronted with an instrument panel on an AC resembling something out of Battlestar Galactica. Operating the BLACK + DECKER is a cinch even if you’re not particularly tech-savvy. The remote control simplifies things further. You can program the unit to come on and go off at any time of the day. There’s even a handy sleep function if you want this neat little AC in the bedroom. Sometimes, the window kits installed with portable ACs can be something of a nightmare to get to grips with. With the BLACK + DECKER, installing your unit couldn’t be easier. There are clear instructions and you’ll be up and running in no time. This AC comes with a decent energy efficiency rating so you shouldn’t notice a massive spike in your power bills if you want to cool things down on the regular. For some reason, warranties on portable air conditioners are notoriously miserly. BLACK + DECKER serve up no more or less than the competition with a 1-year limited guarantee so at least you’re covered for that period. Their customer service, if needed, is first rate. Perfect for economically cooling down smaller workshops and rooms from 100 to 150 square feet. Works as an air conditioner, dehumidifier and fan which is unexpected at this price point. Filter slips out tool-free and easy to wash for maximum convenience. Window kit is super-simple to install and comes at no extra charge. Controls are a breeze to use and fully programmable through 24 hours. No need for messing around emptying buckets due to advanced design of de-​​​​​​humidification. Casters and carry handles make this nifty little AC truly portable. Weights just over 50 pounds and measures up at 16 x 11.5 x 26 inches so perfect for compact workshops. 1-year limited warranty as with most portable ACs covering all normal wear and tear. You need to wait at least 24 hours before starting the AC if it has been transported in anything but an upright position. Some reported issues with leaking. Absolutely no use for larger rooms or workshops so don’t choose the 8,000 BTU model expecting a powerhouse. Not everyone wants or needs a hulking great air conditioner far too powerful for the space they want to cool. In steps the BLACK + DECKER BPACT08WT to deliver just enough power and performance without going over the top. If you have a small workshop and you want a compact, easily transportable and energy efficient AC unit, this is well worth road testing. If you need something capable of bringing down the temperature in a larger area, opt for one of the beefier models in this range. Overall, this portable air conditioner is a winning combination of functionality, versatility and more than adequate performance. Try one out today! As we near the end of our best portable air conditioner reviews, a halfway house with this 10,000 BTU portable AC coming in at an extremely budget-friendly price point. There’s not too much information available with this unit as is often the case with less recognized names. We’ve done our best to dig up the main salient points for you so you can decide whether this affordable but capable air conditioner is the right one for your needs. Going for a lesser-known brand can often yield a surprise winner. If you do your research rather than going in blind, you can come up with a real bargain and the Costway is a classic case in point. If for whatever reason you can’t install a window AC but you still need to regulate the temperature in a smaller room, the Costway is the ideal solution. Rated at 10,000 BTU, this AC will cope with cooling down rooms up to a maximum of 200 square feet without becoming overworked. The timer, inkeeping with more expensive alternatives, can be programmed throughout the day so say goodbye to coming home and finding the room too hot for comfort. There’s a neat remote control so you can control things from across the workshop rather than breaking off from the project in hand. Two-way air deflection means you can get air circulating both up and down eliminating those annoying areas of heat within an otherwise cool room. Many portable air conditioners are rather bulky but the stripped-down Costway will fit nicely in a corner even in a more restricted area. If you need to shift it around, 4 casters ensure you won’t need to lug it around manually. Installation is not too challenging. You should note, though, that you will need to vent this air conditioner through a window. You’ll get all you need to accomplish this included with your package but it’s worth being aware of so you don’t get a nasty surprise and find you can’t accommodate this requirement when it’s already too late. You’ll be able to adjust the temperatures through a wide range from 62 degrees right through to a much warmer 86 degrees. We should add there a number of complaints from users, even those with small enough spaces, about the Costway not getting things cold enough. 10,000 BTU so ideal for smaller workshops where mounting a window air conditioner is impractical. Wide range of temperatures at your disposal from 62 degrees Fahrenheit up through to 86 degrees Fahrenheit. Easily programmable timer can be accessed through remote control so exercise full control even when you’re not at home. Small unit equipped with wheels so you can roll it from living room to workshop with ease. 2 speeds on fan so enjoy the ability to fine-tune this AC using the remote. Quick and easy to install with window kit provided so you can get going almost straight out the box. Up and down air deflection maximizes efficiency while reducing the chance of any hot spots in the room. You’ll need to vent the Costway to a window with the exhaust and tube provided which can look a little messy. Take into account that you’ll need to empty the unit when it fills with water which is tiresome. Reported issues with failure to keep rooms adequately cool. With cheaper portable air conditioners, there’s always a degree of compromise involved and for these reason we have flagged a number of drawbacks with the Costway. There’s little worse than stumbling across websites that give glowing reports of every product without seeing fit to mention where they don’t fare as well. Venting through the window means the set-up can look a little unsightly and the fact you need to drain the unit when it fills with water is well worth bearing in mind. Forewarned is forearmed. If you’re prepared to overlook these niggles and you have a smaller room you want cooled down without feeling like you’re in the middle of the Arctic, the Costway represents a very affordable and competent portable AC that, if properly maintained, should give you decent service for many years. If, though, you don’t fancy messing around emptying your AC and you want a cleaner look – perhaps you want it in the living room rather than the workshop – you’re much better off investigating one of the other options on our list. We would recommend the Costway but with reservations. As we round out our best portable air conditioner reviews, another upscale model, this time the PH14B from Friedrich. Where many of the other ACs we’ve featured have been 3-in-1 units, Friedrich trumps this with a 4-in-1 beauty offering you the de rigeur air conditioner/fan/dehumidifier combo with the added bonus of a heater thrown in. This portable air conditioner is certainly not cheap but we think you’ll agree, when you’re done reading, that it actually represents shockingly good value for money. The Friedrich is fairly expensive for a standalone portable AC but you’ll also get the standard fan and dehumidifier thrown in alongside heating for when the weather turns. This is something not available on much of the competition and one way to justify the higher price tag. If you’re just looking for a basic portable air conditioner, this is not your best option. Build quality is first-class with everything feeling solid in this 86-pound beast. With some snap-in hoses, getting started with the Friedrich is a piece of cake. You’ll also be able to move it around from room to room if necessary taking advantage of the wheels underneath and handles on the sides of the unit. If you have a more spacious workshop or living space, this AC is rated at 13,500 BTU and can comfortably cool down or heat areas of around 500 square feet. Friedrich makes the bold claim it can cope with up to 700 square feet but we’d recommend taking this with a pinch of salt. It will do the job but it won’t be as effective in areas that large. Dehumidifiers often call for you to drain them when they’re full but you’ll get no such nonsense with the Friedrich. You’ll also enjoy overflow protection built in so you can let the AC do its work without worrying about a potentially dangerous spillage in the workshop. Temperature can be controlled with the remote from as low as of 60 degrees Fahrenheit on up to 90 degrees at the top end. Double vents mean that the air in and out both come from outside rather than pulling in hot and humid air from your home. There are a few minor gripes with the Friedrich, notably the tasky interface. With an AC at this price point, we’d expect a bit more thought sunk into ensuring that operation is more straightforward. If you shy away from tech in general, bear in mind that using this unit is not exactly simple. The exaggerated coverage area quoted is purely an annoyance and doesn’t change the fact that the Friedrich can cool or heat substantial spaces. The noise generated is in line with pretty much any portable air conditioner so we can’t level that complaint at Friedrich itself as much as make a general comment that these units are not quiet. Fairly compact at 15.5 x 19.5 x 33.5 inches but comes in at a weighty 95 pounds to max out cooling and heating power. Get the convenience of a heater, AC, dehumidifier and fan rolled into one hard-hitting package. Self-evaporative system sidesteps any need for emptying buckets and is partnered to overflow protection giving you technology at its very best. Dual-hose system means you can get things cooler quicker. Great for medium to large spaces with this 13,500 BTU unit capable of cooling or heating 500 square feet – the manufacturer claims 700 square feet but this is an ambitious estimate. Extremely energy efficient for such a powerful AC. Temperature range of 60 degrees Fahrenheit up through 90 degrees with an operating temperature of 14 to 95 degrees Fahrenheit so plenty of flexibility. Expensive for a portable unit although if you can afford it, it’s still great overall value. Interface is tricky to use which is a disappointment. As with all portable ACs, noise is an issue. Maximum coverage area is overstated by the manufacturer. While you can certainly find much cheaper portable air conditioners, you’d need to go a long way to find a better one than the Friedrich PH14B. This member of the ZoneAire series offers you everything you could want in a climate control system alongside all the convenience of a portable unit that won’t need costly professional installation. If you’re looking for a single unit that will serve up all your cooling and heating needs and you don’t mind spending a little for the privilege, picking up the Friedrich is an extremely sound idea, whether it’s for the home or workshop. Crowned with a class-leading 5-year limited warranty, what are you waiting for? Give one a try and we guarantee it will deliver in the finest style. If you have a workshop in a garage or basement, often regular window or in-wall ACs are not the best fix. If so, portable air conditioners represent a superb compromise. Sure, they won’t generate quite the same iced conditions as you’d expect from a bulkier AC. You might spend a little more on your power bill and the efficiency is nothing to write home about but, bottom line, you’ll be able to break out your power tools in comfort. Rather than adopting an all-or-nothing approach, think creatively and put a stop to a stifling workshop with one of these portable ACs. With any appliance or tool, price always plays a role but don’t let the bottom line dominate your decision. Think about your budget and stick to it but, with air conditioners, it’s about more than the price tag. Consider efficiency and performance rather than fixating on the initial cost. Spending a little more can sometimes save you money over time. Finding worthwhile information on portable air conditioners is something of a headache. There’s plenty of stuff out there but much of it is skimpy or pretty inaccurate. Take the time to study our detailed guide, read plenty of portable air conditioner reviews and familiarize yourself with these handy devices before launching in. Another great way to get a balanced idea of the upsides and drawbacks of the ACs on your shortlist is to read user feedback online. You’ll generally find out more about the notable flaws with any given product than if you rely on the manufacturer’s website. Before giving any attention to the air conditioner itself, think long and hard about the dimensions of the room you intend to use it in. We’ll look next at BTU ratings and these can be used as a guide to show what air conditioner would work best for varying sizes of room. Energy Star produces a very sound guide to room sizes for ACs here that will help you establish a general baseline to operate from. Once you’ve firmed up the size of the room, this will automatically narrow down your options to a more manageable number. Air conditioners are rated in BTUs (British thermal units) and this will help you calculate whether or not the AC you have in mind will be fit for purpose. For example, an AC rated at 10,000 BTU will cope with cooling a 250 square foot space. 12,000 BTU air conditioners can deal with 400 square foot rooms while a beefier 14,000 BTU unit will single-handedly cool a 500 square foot area without becoming overburdened. 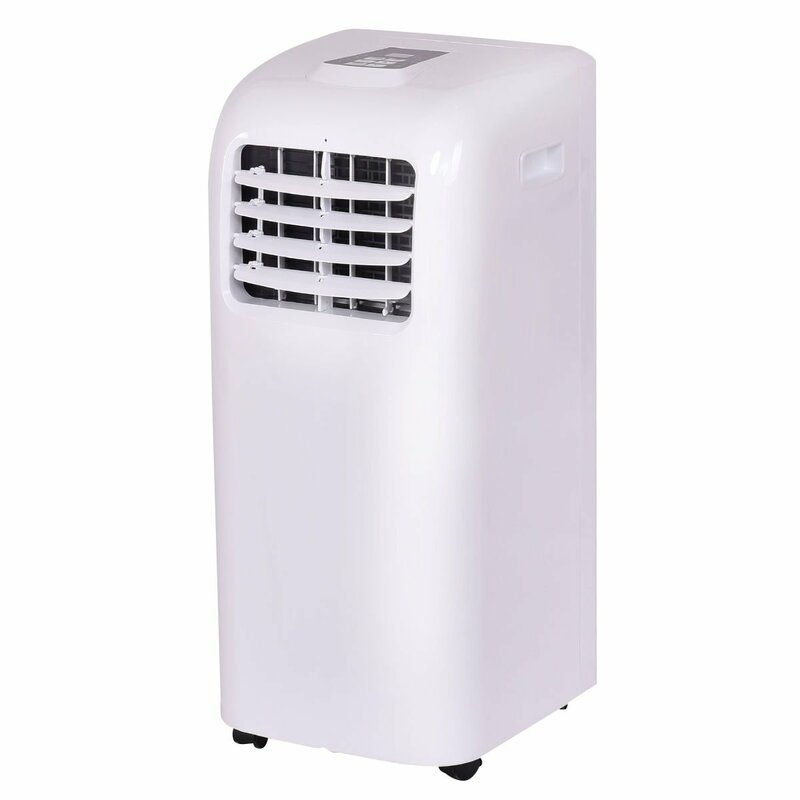 Many portable air conditioners serve double duty as air purifiers. This is particularly valuable if you or any members of your family suffer from allergies and sensitivities. Whether it’s dust, sawdust in the workshop, pollen, pet dander or other fine particles that can wreak havoc with your circulatory system, look for an AC with this functionality if it’s appropriate. These units come in especially handy in a workshop. Although it might on the surface seem straightforward, installing a portable air conditioner can be awkward if you don’t plump for a user-friendly model. Think in advance about any windows or sliding doors where you can mount exhaust and inlet hoses while ensuring everything is tightly sealed. While you’re mulling this over, think too if you have the requisite tools for installation. Measure up your window then compare the kits provided with the units you have in mind to determine if it will be a suitable fit. Time spent at this stage is absolutely crucial. Overlook these precautions and steaming straight in will potentially result in a beautiful portable air conditioner that won’t fit into your workshop. Many portable air conditioners can kick up a tremendous racket. It’s pointless to pretend otherwise. bedroom is the last thing you need. It goes without saying that a portable air conditioner will see your monthly power bill surge as the temperature drops like a stone. 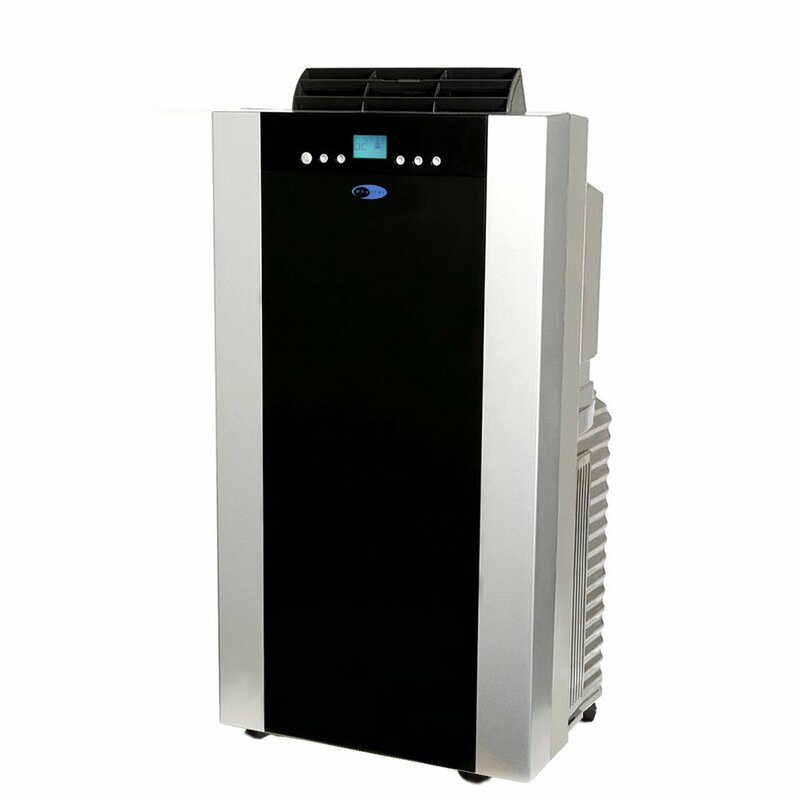 All air conditioners sap power and portable units are among the least efficient options at your disposal. That being said, you can go some way to mitigate this increase in electricity consumption by focusing on models known to be energy efficient. Manufacturers provide EER (Energy Efficiency Ratio) figures so you can see how much power the AC will use relative to its power output. This figure might seem difficult to get a handle on so consider 9 as a rough average with any ACs scoring 11 or more being the most economical and efficient. ​Since using an extension cable with a portable air conditioner is frowned upon – and might even invalidate your warranty – the length of the supplied power cord is something well worth bearing in mind. Since ACs gobble up the power, using an extension cord presents a very real risk of overheating and you’ll have a potential fire hazard on your hands. Think about where you’ll be placing the air conditioner and make absolutely sure you don’t sell yourself short by choosing a model equipped with a restrictive power cord. We are certainly not talking about pocket-sized units but appliance weighing in at anywhere from 50 to 100 pounds. Rather than being tricked by the marketing hype, have a good long think about whether you have the space to accommodate the AC you have your eye on before committing to purchasing a unit that might be too big for comfort. Now you’ve firmed up all the main bases you need to cover before purchasing a portable air conditioner, how about what to do once you have one installed? Once you’ve got your portable air conditioner installed according to the manufacturer’s instructions, running it is remarkably simple. Either use the remote control or the buttons and dials on the unit itself and regulate the temperature accordingly – it really is as simple as that. The only obvious point to make about usage is to consider how much you’ll keep the AC running since power bills can rapidly escalate out of hand if you use the thing willy-nilly. Clean the filter at least once a month. This step is indispensable if you want the unit to continue operating effectively and efficiently. It will require no more than a minute or two to dust off the filter and you generally won’t require any tools for this so there’s no excuse to neglect this. In general, try to keep curtains or blinds drawn if the space you’re trying to cool gets plenty of direct sunlight. Use some foam insulation strips to close off any gaps around the window. This will stop warm air working its way in through any exposed nooks and crannies. Aim to position your AC as close to the window as possible so the hoses stay short. You can use duct tape to further insulate the hoses if you see fit. Overall, running and maintaining a portable air conditioner is a stress-free experience as long as you keep that filter nice and clean! We very much hope you’ve found these portable air conditioner reviews have helped edge you toward deciding upon the best appliance for your home and personal requirements. As with any home appliance, it’s a case of unearthing the best solution for you rather than angling for a right or wrong answer, for a definitive best product. Hopefully, through this guide and these portable air conditioner reviews, that decision just got a lot easier. Although this site is primarily driven by a focus on power tools, many readers got in touch asking us to come up with something to help them keep their workshop cool without spending a fortune. The result is today’s portable air conditioner reviews. So don’t hesitate to reach out any time if there’s anything you’d like us to cover here at Miter Saw Judge. All aspects of woodworking, however tangential, are fair game so let us know what you want! British thermal units are a specific unit of energy expressing the energy required to lift the temperature of 1 pound of water by 1 degree Fahrenheit. Using BTUs is a simple way to differentiate between air conditioners and compare them like-for-like. 2) IS A HIGHER BTU RATING ALWAYS PREFERABLE? In a word, no. You’ll undoubtedly get more power with a higher rated air conditioner but, on the flipside, they’ll generally kick out far more noise. If you want to use the AC overnight and you’re a light sleeper, this can be troublesome. Also, the higher the BTU rating, the less portable the air conditioner so it’s a case of finding a happy medium rather than fixating on a number. 3) WHICH AC IS BETTER, ONE WITH A SINGLE HOSE OR ONE WITH A DOUBLE HOSE? Dual-hose ACs have one hose of the exhaust and one for the intake rather than models with a single hose to perform double duty. Dual hose air conditioners do have a slight edge in terms of cooling power but there really isn’t much in it. It’s certainly not something worth basing your overall decision on. 4) IS AN AIR CONDITIONER REMOTE CONTROL ESSENTIAL? In a word, no. They are a nice bonus but the absence of a remote control should not be considered a deal-breaker. One key advantage is that you’ll get more information about the actual temperature with a remote controlled unit. They also make it easier to manipulate timers and automatic settings. Think about what, exactly, you want from your AC then decide if a remote is something you really need. 5) WHAT ARE THE LOUVERS ON AN AIR CONDITIONER? These louvers help direct air flow. Some air conditioners have fixed louvers although these are now in the minority. Automatically oscillating louvers, on the other hand, direct the air in a wide sweep around the room for superior efficiency and maximum cooling power. 6) HOW USEFUL IS AN AUTOMATIC ON/OFF TIMER ON A PORTABLE AIR CONDITIONER? Like so many aspects, this is a case of horses for courses. If you work long hours and live somewhere in an inhospitable climate, it’s a nice touch to make sure you AC kicks in before you arrive home so you don’t walk into a sauna. If, on the other hand, your portable air conditioner is set up in your home workshop, it might not be such a critical factor. 7) HOW DOES A PORTABLE AIR CONDITIONER WORK? The rudiments of operation are exactly the same with portable air conditioners as with built-in AC. Warm and humid air is sucked in, dehumidified and blown back into the room. 8) HOW LONG WILL A PORTABLE AIR CONDITIONER LAST? If you look after your portable AC properly, you should get many years of use from it. A neglected AC will develop problems after a few years but, take care of it and it could happily deliver 5 years of solid service, perhaps more. 9) WHAT IS THE OPTIMUM TEMPERATURE TO SET THE THERMOSTAT AT? Choose the highest temperature that still allows you to feel comfortable. There is no right or wrong here so go with what works best for you and your family. Remember, though, if you ice things up too much before the weather gets really hot, you’ll struggle when that time comes so think ahead and get used to a higher temperature until you really need to max it out. 10) WHEN IS IT TIME TO REPLACE MY PORTABLE AIR CONDITIONER? As a rule of thumb, once portable air conditioners get beyond seven years old, repairs generally prove uneconomical and it makes sense to replace the unit.